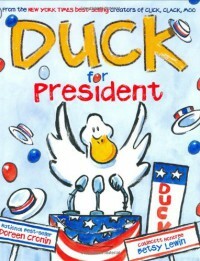 Duck for President by Doreen Cronin does a phenomenal job of educating readers on the process of nominating and electing a person in office as well as gives an insight on the responsibility of the President. I love the concept of using animals rather than people in this story because children are more likely to be engaged. This also encourages imagination as animals do not truly have these roles but are being given human characteristics. I really enjoy how smoothly this book transitions from a conflict in the story, to nominating Duck for President, to election day, etc. The story line is written so well, readers may not even notice that they are learning in the process. I would use this book in the classroom to introduce a lesson on electing a president or the roles of a president. After reading the book, I would ask students to make a poster that has a picture of a person in their lives (favorite TV show character, friend, family, teacher, etc.) who would make a great president and list words or phrases explaining why people should vote for them. These signs would then be displayed around the classroom and in a confidential voting, I would ask my team teachers to vote on their "Team President" based on the posters. The person who made the winning poster will get a shoutout and have their work displayed in the class e-newsletter but I will remind students that there will be more opportunities for student's work to be displayed in the future and that we should congratulate the "winner."